Anyway, back to Todd and Viola. They’ve both been through a lot. They are good people, but along the way, they’ve had to make some hard decisions. And the stakes are raised even more this time around, because it’s war – and the outcome is going to determine the fate of the whole planet. And since this is a book about war, I want to talk about the battle scenes a minute. Battle scenes often bore me, because usually, we only see the POV of the heroes, how they are stomping all over a faceless, probably evil, enemy. But here, the enemy isn’t that clear cut. We get to know people on all sides, to sympathize with them, to understand that with every death, every injury, something is lost to someone. Ness adds a third POV, from one of the indigenous Spackle, and we come to sympathize also with them and gain more of an understanding of the world’s politics. If I have any complaints at all about this installment, it’s that there was one part of the ending I found very….strange. But that’s spoiler territory, so I’m done here for now. Find out more about the series at the author’s website. This sounds awesome. I haven't heard of the series before and I'm glad I stopped in. LM - It IS awesome. Glad you stopped in too! The first in this series was...too intense for me. I loved it and couldn't stop reading, but after I was done I'd read too fast and felt sick. I could never prod myself to go through the experience again for the second book. I'm really bad when it comes to most series. 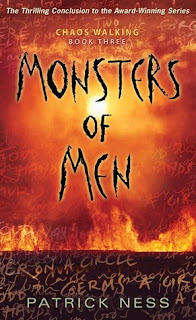 The Ask and the Answer hooked me, and I can't wait to get my hands on Monsters of Men. Yes. 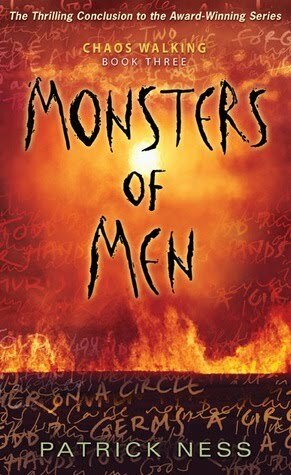 This entire series is amazing, and Monsters of Men was a fabulous and fitting end to a wonderful, disturbing, and provocative series. It's one of those books that I had to read fast because I was so invested, but wanted to read slow because I didn't want the series to end. 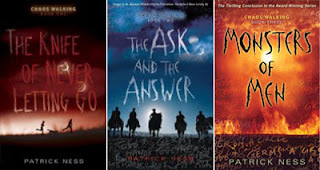 Bravo, Patrick Ness. He knows how to create villains, that's for sure! After hearing so many good things about this series I broke my no new books in August promise and got The Knife of Never Letting Go from the library today. All sources indicate that it'll be worth it though! I put these books on my TBR list. They sound stellar! I still need to start this series. I felt like the first one got mixed reviews, so I didn't think about it much, and then the subsequent two received fab reviews. It sounds like this is the dystopian series I should try. I loved this book too, and thought the series was very entertaining. They were all intense reads, but they sucked me into the story so thoroughly that I can't complain about that. Even though I loved the last book I had issues with the ending, and thought it might have been a better, more realistic story if it had ended sooner. Wasn't it incredible Lenore? And you're so right...one of the things I loved so much about this one is that you never entirely know who the enemy is. Ness is just a genius! And I thought the same thing...I thought that poor Todd's horse was a goner before I even started the book :( Ness takes no prisoners! I was just convinced he was going to kill her. Those battle sides just completely broke my heart. And I'm curious about which part you found strange! I have this one sitting on my review shelf. I LOVED The Ask and The Answer. This has fast become one of my favorite series. What a great review! And kudos to you for enticing many others to read the series. There are many of us who have been singing the praises of these books loud and long, and wonder why EVERYbody isn't on board yet!! Thanks for your two cents! Oh! In case you're interested, there is a discussion group on FaceBook that I invite anyone to join. Rabid fans there who share thoughts. There are posted reviews (I just posted this blog review!) and more. Patrick Ness is also a member! It's an extraordinary series isn't it? I finished Monsters of Men feeling completely wrung out and in buckets of tears (that last line!! Even thinking of it makes me shiver). I am constantly amazed that more people haven't read the books and am now quite evangelical about them - I've bought copies for several friends. Just absolute writing genius. I heart these books so much! And I really can't wait to read MoM. Especially knowing it lived up to the rest of the series. And I agree, Mayor Prentiss is one scary villain. Ooh! Five zombie chickens? That's a great endorsement right there! I also have a lot of trouble with battle scenes, I tend to tune out whenever they show up on the page, so it's good to hear that this book doesn't fall into that trap! Great Revie. I loved these books and was Team Boycolt too!! I loved the fact that they could hear the animals. 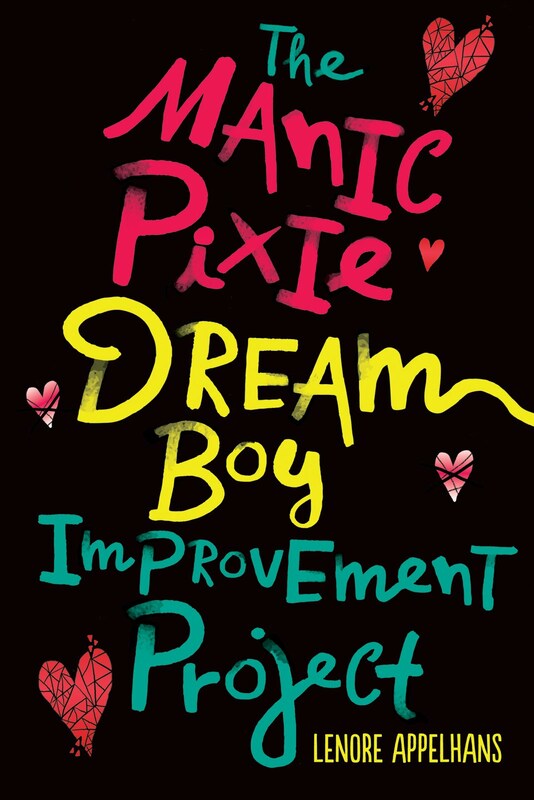 I cannot wait for this book to come out!!! I'm not surprised that the ending was strange. Ness has a way with endings, don't you think? As long as the ending for this last book doesn't make me want to chew my nails off like the last two, I'll be happy. I thought this was an incredible conclusion to the trilogy too--definitely five zombie chickens. :p Especially the--er, not wanting to get all spoilery, I guess I would say, especially the character who proved to be living with the Spackle. Marvelous. I'd been looking forward to this review - I don't know how I missed it. MONSTERS OF MEN seriously blew my mind. The mayor was one of my favorite characters, too. <3 this series. Must buy the first two books sometime. I wasn't terribly crazy about the first of this series, but I went ahead and bought the second one anyway to see what happened. And found this one in the library - I have just read them both and wow, am I glad I kept going. I don't even know how I'm going to manage a review!